To enjoy sound and music conveniently, ceiling speakers are the best options. You don’t have to find the right place for them to sit every time you use them. Or no fear of bunches of wires tangling with your feet. Space-saving quality speakers are becoming a must. Ceiling speakers give you a natural music listening experience. Once you have installed them, you are tension free and can play music in minutes or even less. Ceiling speakers are gaining their importance in the home and residential uses. Some of the best ceiling speakers come with the easiest installation. There is a range of features found in different speakers in the market. Their diversity can help you find the right one for yourself. However, the large variety can cause confusion to choose from. This article will help you avoid getting confused and pick the best ceiling speaker for yourself. 2 How To Choose Best Ceiling Speakers? Polk Audio is one of the most renowned manufacturers of speakers for residential use. The RC80i is another ground breaking product they have launched. These are moisture resistant speakers that promise surround sound experience. Install them anywhere, including your kitchen and bathroom, safely. The speakers also include a built-in 8 inch woofer along with a 1 inch tweeter. This ensures that you hear a more detailed, deeper bass and quality sound. The speakers have a unique and stylish appearance of their own. But their aluminum, powder coated grille also allows you to paint them any color. You can use a spray paint to match the speakers with your interior. These versatile speakers can also be installed outdoors. It has a rubber surrounding cone. This makes the products more durable and long lasting than others who have foam surrounding. It’s paintable. Can easily blend in well with your interior. Can be installed outdoor safely. Moisture resistance increases the diverse options of use. Has a frequency range of 35Hz to 20 kHz. Wider range allows wider sound coverage. Clear and quality sound ensured with the 1 inch tweeter and 8 inch built in woofer. Volume can be adjusted from low to loud. They produce crisp and detailed sound. When the volume is set at maximum, the sound may distort. This is an 8-inch and 2-way speaker by Micca. It diversified features can be guessed by the fact that it is both in-ceiling and an in-wall speaker. And that’s not all. The speaker has an 8 inch poly woofer for better bass and clarity. Along with a 1-inch soft dome tweeter. Install it in any large living space and have an equally balanced sound. The woofer and tweeter work efficiently together with the 6db cross over network. The size of this speaker makes it ideal for larger rooms. It is paintable, which means it will not ruin the look of your room or living area! The speaker sound ranges from low-volume background music to loud, theatre sound experience. The speaker comes with flexible, diverse and convenient features. High-quality sound and greater sound coverage. Low to high and theatre sound range. Installation is easy. Requires basic tools. Affordable and good value of money. The sound may lack depth compared to other products. This speaker model by Yamaha is one of the bests in the market. It is a 3-way in-ceiling speaker. Yamaha is known for its quality products, and this is surely one of them. These speakers are sold in pairs. One outstanding feature of these speakers is the dual ¾ inch dome tweeters. And not only that, the tweeters are also accompanied by high quality woofers. A well balanced and high quality sound is ensured with these Yamaha speakers. The swivel tweeter allows sound to be dispersed equally. This makes it suitable for large area coverage. The speakers are 6.5 inches in size and are sold in pairs. This means that they can be installed in a large room and can still be good enough. The strongly built and durable speakers can be used for low sound or as a theatre sound speaker. Efficient sound dispersion with the dual tweeters and mica cone woofers. 6.5 inch size makes them suitable for large rooms. Can be used as surround side speakers or presence speakers. This is another top-notch, high quality ceiling speaker by Yamaha. The speaker has a high quality mica cone woofer, and a fluid cooled tweeter. The tweeter is designed in a swivelling manner that allows it to efficiently and effectively disperse sound. It is made with cross over technology that means the speaker can produce high, mid and low frequency ranges. The appearance of these speakers are also well designed. They will give your interior an outstanding look with their slim and sleek design. The speakers will blend in well with your interior. They produce natural, clear and detailed sound quality. If you are in search for a good sound producing speaker that is durable and reliable, this is the one for you. They are suitable for use with a theatre system. They will give you real cinema-like sounds. Moreover, they are completely paintable. So not only their design makes them blend well with your design, they can also be painted to suit well with your home. The installation is made twice as easier with these speakers with the magnetic grille feature. You simply have to place them on the speaker and the grilles will be fixed. High quality sound is produced. Can produce loud sound without any distortion. Suitable for use with theatre systems. Sealed, protective back cover that makes it moisture resistant. Tweeter cannot be manually adjusted. These speakers by Pyle come in pairs. They are a 2 way powerful speaker. That can be installed either in ceilings or in walls. The speakers have a 1 inched directable dome tweeter. Including a high quality and powerful 70V amplifier which ensures that clear and detailed sound is produced. You will not be disappointed in this product’s appearance as well. It is designed in such a way that it can blend in or flush with your ceiling design. These are stereo sound speakers and is midbass, which means it can produce higher bass frequencies. The powerful speakers can take up to 200W of power input, this allows them to produce high volumes as well. The pair of speaker come with spring terminals that also allow easy installation. They have a compact design and can be installed conveniently in either walls or ceilings. 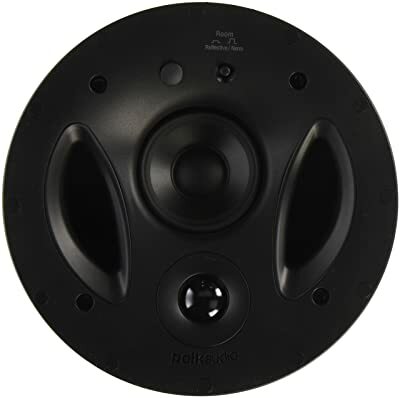 Directable dome tweeter allows better dispersion of sound. 6 inch in size. The pairs are suitable for large rooms. Durability is high with their powerful and quality built. Frequency response is lower compare to other products in the market. Grilles become loose after some time. 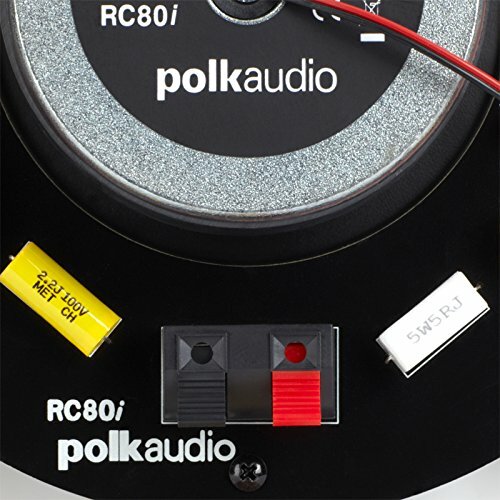 Easy installation is taken a level up with the wafer-thin and magnetic speaker grilles in Polk Audio 70RT. You don’t have to worry about fixing the grilles again and again. They will be intact with the speaker with their magnetic feature. The speaker has 3 drivers that include a ¾ inch tweeter, a 7 inch subwoofer, and a 2.5 inched balanced driver. This means that the sound quality is enhanced and of high quality. It also has a dual bandpass port that creates a higher and better bass. It also ensures that the sound is not distorted and covers a large area. It is best for you if you want to have a detailed and high bass sound experience. The vanishing series speaker also blends in well with your ceiling and even has paintable grilles. 3 drivers ensure high quality sound with maximum coverage. Good frequency response range of 48-25,000 Hz. Magnetic grilles for easy installation. Installation is made easier with Perfect Fit Template and a precision flange. Bass and sound quality can be disappointing and not up to the mark. Bose has a reputation of manufacturing best and highest quality speakers in the market. 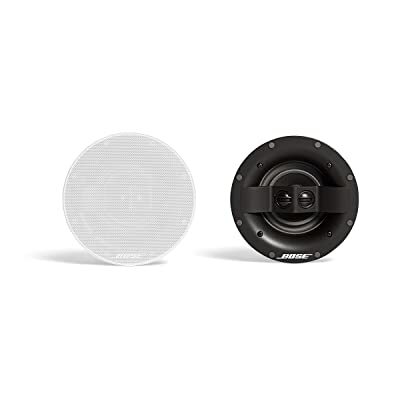 This in-ceiling speaker by Bose is also another reliable and groundbreaking product. The speaker features a 5- inch powerful woofer with a ¾ inch tweeter. The tweeter is placed in such a strategic manner that its efficiency and effectiveness is maximized. The speaker produces high-quality stereo sound that also covers a large area. And that’s not it. The grilles of the speaker can be easily painted to match your interior. They attach to the speaker magnetically, which means the installation of these speakers is easy and quick. Even if you don’t paint the grilles, the speakers are designed in such a way that they will still blend in well with your home. So these high-end, top quality speakers by Bose not only provide you with best quality sound but also enhance the look of your home. A well-balanced sound is assured by these speakers. Without any drop- offs, stereo sound will cover a wide area. High-quality sound and well balanced. Virtually invisible. And also paintable grilles. Magnetic grilles allow easy installation. Standard dogleg clamps for easy installation. 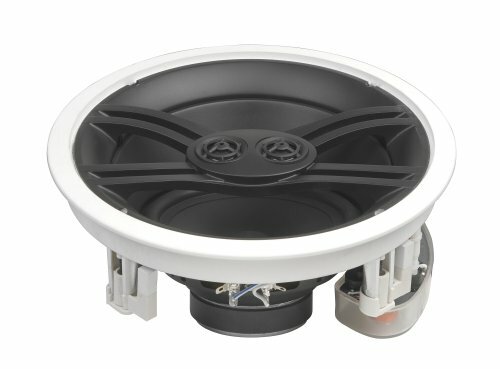 How To Choose Best Ceiling Speakers? Different people use the same products differently. And there are so many speakers to choose from. Which is why you need to know what qualities of the speaker match your needs. 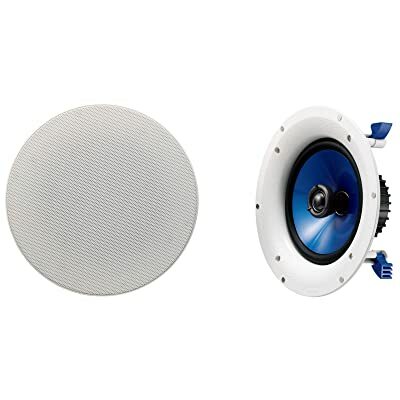 Ceiling speakers come in a range of sized. Some are 8inched speakers or some could be 6 inches. The size you choose depends on how you intend to use it. A large, 8 inch speaker for a small kitchen or bedroom will not make sense. You need to balance the size of your speaker with the size of your room. For a large living space, where the gathering of people will also be larger, you need a larger speaker. For large spaces, a pair of 8 inched or four 6 inched speakers should be enough. One 8 inched would not be sufficient and the sound will not be equally distributed. For smaller rooms like bedrooms, one 6 inched speakers should work. Speaker sizes may range from 3 to 8 inches. If you are looking forward to installing the speaker outdoors, choose a speaker that is weather resistant. The built of the speaker should be sturdy and durable. It should be able to withstand unexpected harsh weather conditions. It should specifically be water resistant. For places like kitchens or bathrooms, moisture resistant speakers make a lot of sense. If you intend to use the speaker for background music, you do not need a speaker that has a very high volume or loudness. Speakers that are used for background sound purposes also may be cheaper than others. If you intend to use the speaker for jamming purposes and loud music, a higher volume speaker is recommended. For larger areas, the frequency of the speaker should be greater. Higher frequency allows for a better sound balance in the room. What is so great about ceiling speakers after all? Space savers. You can get stereo sound and high-quality sound with just one speaker. And even that is installed in your ceiling. Which means you don’t have to worry about finding space for your speaker. They allow you to utilize the saved floor space for something better or more necessary. Cables and wires don’t ruin the look of your interior. The foremost benefit f in-ceiling speakers are that they do not have wires and cables running across your floor. You can go wireless with these. Ceiling speakers are now coming with “tweeters” that disperse the sound in all directions. Your whole room can be filled with equal sound. Now you don’t have to worry about not having enough quality sound in a large room. In-ceiling speakers are much more stylish and good in terms of appearance than other speakers. Your interior will have its own unique look with ceiling speakers. a modern and sophisticated touch to your room or living space. You can install ceiling speakers anywhere you want. Their water resistance quality even makes them suitable for outdoor use. And who thought installing speakers in you washrooms or kitchens can be this convenient, and safe? 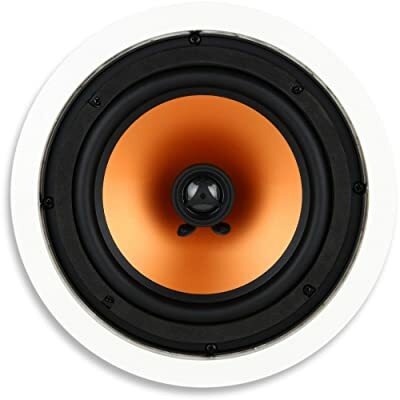 Ceiling speakers give you the same quality sound that traditional box speakers do. But with more convenience and flexibility. The increasing quality of ceiling speakers has made them popular for residential use. Even their installation is not so difficult, and some products can even be installed without professional help. Tweeters are built-in most of the ceiling speakers in the market. The function of tweeters is to disperse the sound in all directions, equally. Tweeters are type of a speaker driver used in speakers that produce the highest ranges of frequency. The higher the frequency, the better the sound coverage. These also make the speakers loud and clear. Many in-ceiling speakers come with a rubber sealed drive. This prevents moisture from entering. 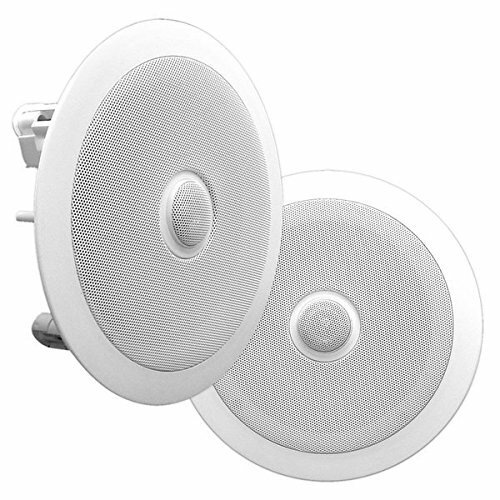 This feature makes the ceiling speakers reliable investment and a durable product. One of the most outstanding features many speakers offer is that they are paintable. This allows you to can match the color of your speakers with the color of your home or interior. Woofer cones produce low-end frequencies for the low end bass ranges. Usually, these are accompanied by tweezers. A pair of these both in any speaker ensure high quality sound and a positive user experience. After reviewing 7 competitive ceiling speakers, choosing one winner may be a challenge. However, we can conclude that the Micca M-8C is the winner. At such a price, it is a surprise to find such a great variety of features. It lacks nothing. From paintable grilles to a pivoted tweeter, everything is included in this speaker. The Bose 742898-0200 may be of high quality and by a reliable manufacturer, it is still too pricey. Why spend such an amount on features that you easily find in other inexpensive products? Apart from that, your final choice depends on your own budget, your willingness and your expectations from the product. Every user has a different purpose and aim, and the final choice is always about personal preferences.